Actually, no, it’s not. And it’s not feeling much like it either. I was saying yesterday on one of the Ravelry boards I participate in that, in spite of the fact that I have everything to be happy about this year, I have no Christmas spirit at all. None. And it seems I have several friends in the same headspace, which is stranger still. I am listening to Christmas music every day in my office. One of the benefits to working from home: you aren’t bothering anyone else with your musical choices. I have done no baking. In fact, my mom showed up with a crate of it for me the other day, saying that because I am working full time and we are just finishing up the house, I probably don’t have time to do any baking. She is right…the fact that I have totally lacked the inclination is an altogether different matter. There is no decorating done beyond the tree and some lights that my husband put up outside. He is pretty excited to have a house for Christmas. Maybe 11 degrees Celsius and rain just isn’t conducive to Christmas spirit for me? That was the weather here on Monday. Maybe, as someone so kindly pointed out on the aforementioned Ravelry board, I am just plain exhausted. It has not exactly been an uneventful year. Last night I decided to cast on a new project. None of the dozen or so I had on needles were calling to me at all, and I wanted something bright and cheerful, darn it!! So I hauled out my bin of wound yarn and saw my skeins of Turtlepurl Striped Turtle Toes, in “Polly Wanna Cracker?”. Orange, yellow, green and blue. Perfect. Just the colours to lift my spirits. While polishing off season 1 of The Blacklist (OMG, SO good!!) I got a big chunk of the leg done. Plain Vanilla Sock in Polly Wanna Cracker? In the mean time, I ask this question…what do you do to get into the holiday spirit? 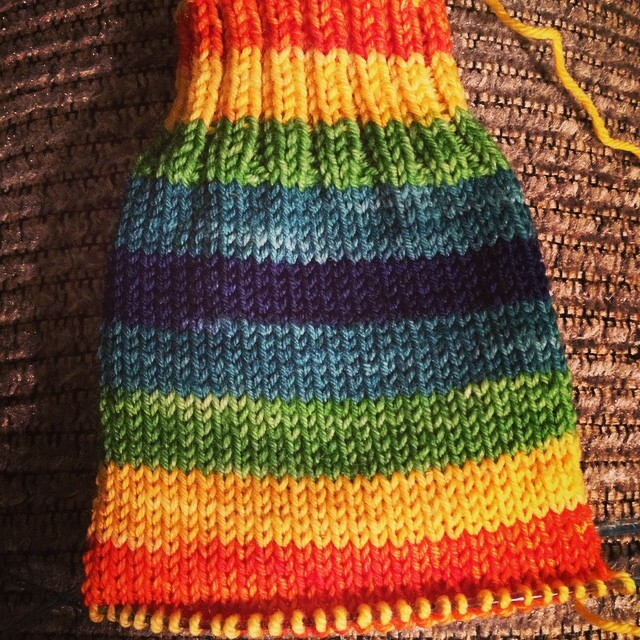 This entry was posted in Uncategorized and tagged christmas, sock knitting, socks, turtlepurl by Rayna. Bookmark the permalink. I’m having a hard time getting into Christmas spirit too… There’s snow here, but fall has been so busy for me this year at work that my heart can’t really feel the holidays coming although my heads knows it’s right around the corner. It’s a really weird feeling.